B&Bs or Guesthouses offer a great, often cheaper, holiday accommodation than hotels. They are generally smaller establishments and can provide more of a personal touch than large hotel chains. 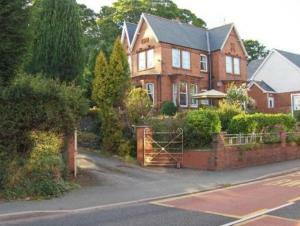 You can choose from 3 Bed and Breakfasts in Denbighshire. If you know the town within Denbighshire you want then the menu on the right will filter the results. Oaklands Bed and Breakfast - Nestled amid the beautiful countryside of North Wales, this charming guest house is situated in Llangollen, within easy reach of all the area's main attractions and beauty spots. Close to Thomas Telford's famous Pontcysyllte Aqueduct, the area has some lovely walks, including the Offas Dyke path. There are 3 pubs within walking distance and a bus stop right outside the door, providing access to the wonderful surroundings. A beautiful Victorian building, the Oaklands has been completely updated to offer all modern facilities, whilst still maintaining its ornate brick work and most of the original features. Castle House B&B - In the ancient walled town of Denbigh, with stunning views of the Clwydian Mountains, Castle House offers luxurious, romantic accommodation, traditional Welsh breakfasts and free spa passes. The beautiful bedrooms are elegantly decorated with luxurious fabrics and floral prints, and each offers Egyptian cotton sheets, a flat-screen TV and free Wi-Fi access. Some have original fireplaces and magnificent views. Dating back to 1820, The Castle House B&B is situated on the edge of 9 acres of mature woodland, with a private footpath to the town's ancient walls. There is a cosy guest lounge and large garden, which features the ruins of a 16th-century cathedral. A generous, cooked Welsh breakfast is served daily, and traditional afternoon teas are also available. Guests can receive free passes to the luxurious Aroma Therapy Thermal Suite and Gymnasium, which offers spa facilities and a range of indulgent beauty treatments. The Golden Pheasant Country Inn - Set within a traditional 18th century timbered building in the picturesque Ceiriog Valley in North Wales, this beautiful country inn is the ideal destination for a relaxing break. Offering peace and tranquillity to those who enjoy the countryside, The Golden Pheasant is just 20 minutes' drive from the small town of Llangollen, or 10 minutes going over the picturesque valley. Set on the River Dee, Llangollen is the perfect starting point for canal boat trips through the beautiful countryside and over the aqueduct to the historic town of Chirk, which boasts a Medieval castle. In the evenings you will have the choice of 2 restaurants and 2 bars, one with slate floor and open range fire in which you can relax and enjoy a quiet drink before dinner, the other in the comfortable lounge with views of the Ceiriog Valley, garden and patios.